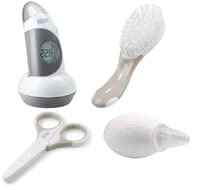 * Das hochwertige 4-teilige NUK Pflge-Set besteht aus je 1x Baby Thermometer 2in1, 1x Baby Nagelschere, 1x Babybürste und 1x Nasensauger. * Praktisch und hygienisch in einem ist die NUK Disney Mickey Schnullerbox. * With the NUK Baby Care Set you are well prepared for everyday life with a baby. The high-quality set consist of 4 parts and comes with 1 x Baby Thermometer 2 in 1, 1 x Baby Nail Scissors, 1 x Baby Brush and 1 x Nasal Aspirator. * Practical and hygienic in one – the NUK Disney Mickey Soother Box. Matching the Disney collection this red box with its cute Mickey and Minnie Mouse design stores up to two soothers. *Stand: 25.04.2019 16:00:42 - Alle Preise verstehen sich inklusive der gesetzlichen Mehrwertsteuer und ggf. zuzüglich Versandkosten.